Science reading list: 10 science books you must read! 10 great science books you really must read! Are books dead? By no means! We might spend all our time reading Twitter tweets and Facebook posts, but there's no substitute for a powerful argument thumping from the pages of a well-written book. Occasionally people send emails via this website asking me to recommend science books that will inspire them on their journey into science. So I thought I'd take a few moments to compile a personal reading list of some of my own favorite volumes—a manageable little selection of terrific tomes suitably for almost anyone, science background or not. There's a bit of a bias toward physics and the physical sciences, simply because that's my area, but I've tried to mix old books and new, the classics of today with those of tomorrow. Read on... and then read on! Lots of big, topical issues are either informed by science or (if Muller's argument is true) certainly should be. In this very readable book, he surveys five big political issues of our time (terrorism, energy, "nukes," space, and global warming), using science to enlighten (and indeed lighten) the debate. There's very little math, which keeps this a lively read for anyone with a keen interest in the news (if you really want to know, the numbers and equations are helpfully tucked away in notes at that back). Generally impartial, there are a couple of places where Muller can't help but take sides: he's pro-nuclear and clearly very frustrated with the exaggerated, unhelpfully polarized debate about climate change. Dr Ben Goldacre has built himself a reputation as a fearless opponent of quacks, charlatans, and fraudsters through a long-running column in Britain's leading liberal newspaper, The Guardian. In this book, he explores a variety of pet peeves, from quack nutritionists and lazy journalists to homeopathists and pill-pushing pharmaceuticals. Although he ranges widely, his arguments circle round a single idea: science is driven by evidence. If there's insufficient evidence or the evidence is misrepresented, science suffers—and society suffers too. Goldacre has a great ability to pick apart arguments based on flawed or selectively presented statistics; this book is worth reading just to remind yourself why statistical evidence must be handled with care. Ben Goldacre's other books Bad Pharma: How Medicine is Broken, And How We Can Fix It and I Think You'll Find It's a Bit More Complicated Than That are also worth a look. If you study physics, you'll find that perhaps 95 percent of what you learn (and 95 percent of what's truly important) is surprisingly old science. It's a tribute to the genius of the great physicists that the stuff they figured out years, decades, or even centuries ago is pretty much still true today. When I was an undergraduate studying physics a while ago, it surprised me that all the textbooks on my course had been written 20, 30, or 40 years before. I'm sure today's students are using exactly the same books: you really could learn most of modern physics using textbooks published 50 or 100 years ago and not be too far wide of the mark. Physics is the nearest thing we have to absolute truth—and truth doesn't date. I discovered "Great Experiments in Physics" quite recently—and what a discovery! It's a collection of about 20 of the greatest physics experiments ever performed, exactly as they were written up by the scientists responsible. So we get Galileo explaining acceleration, Henry Cavendish telling us about his amazing measurements of gravity, James Joule stirring up water to prove the law of conservation of energy, Rutherford splitting the atom, and Einstein himself telling us all about relativity; twenty or so amazing, original scientific papers, briefly introduced and put into historical context by Shamos. The surprising thing is how very readable and accessible all these papers are—certainly within the reach of undergraduates, and possibly high-school students too. What a joy to sit and read world-changing words from some of the greatest scientific minds of all time! Many of us think climate change is the greatest looming threat to life on Earth. That's not a belief: it's a scientific opinion informed by evidence. Robert Henson has written the clearest, most readable guide to climate change I've come across so far. After reviewing basic climate science, he looks at the various symptoms of climate change (from rising seas to more erratic weather), then explores the solutions we still have time to deploy. Henson devotes plenty of space to climate skeptics, but wastes little time on their arguments: this book follows the international scientific consensus that climate change is caused by humans—and must be stopped by them. 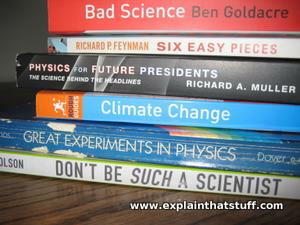 Why include a book like this on a science reading list? It's surprisingly easy to forget that science underpins human civilization. Apart from being interesting, topical, and very clearly written, this book is a perfect illustration of how scientists work on problems that are of crucial importance to the survival of humankind. Science matters—and this is why. Find on Google Books. I believed it's also published by the American Meteorological Society as The Thinking Person's Guide to Climate Change. What could be more boring than materials science? What could be more interesting! Everything we use, everything we do, everything we buy... everything we everything—it's all based on stuff we've found, shaped, and made: on materials, and their science. Written about 30 or 40 years ago, James Gordon's great little introduction to the subject is just as relevant today. It explains everything from why wood rots to why ships rust. There's obviously not much here about the very latest advances—cutting-edge composites, or new discoveries like graphene—but the basic theory of what makes one material different from another, and more or less suitable for one purpose or another, is covered clearly and simply. James Gordon's other classic materials book, Structures, is also worth a look. Here's a book you can read right now, for free: just nip along to the website, withouthotair.com and either read it onscreen or download it (in a variety of different formats). If you do, see if you detect an air of frustration in the words David Mackay writes: why, he seems to be thinking, isn't politics as clear-cut as science? Why can't we make rational decisions about how to provide energy for seven billion (and counting) humans simply by taking the science we all learned at school into account? That's just what he tries to do in this book, which uses easy-to-understand physics to show how we use energy, how we produce it, and how to make the two sides of the energy equation balance. Can we cut back on fossil fuels and still avert a catastrophic energy crisis? Do we still have time to cut carbon dioxide emissions before climate change makes life on Earth impossible? What's the best way to match energy production to energy consumption? Although David MacKay (who died in 2016) was essentially an environmentalist, there's nothing overtly polemic or preachy about this book: he lets the science speak for itself and presents a variety of options so you can draw whatever conclusion you prefer. One point he's very careful to make is that the looming energy crisis is a big problem that needs big solutions; supporting small-scale renewable technologies such as solar power and wind is fine, providing you understand that we'll need to deploy them on a truly industrial scale (it takes about 2000 wind turbines to generate as much electricity as a big coal or nuclear power plant). Read David's book at Without Hot Air. It's rare to find first-rate scientists who are also first-rate teachers. Richard Feynman was one; George Gamow, though you may never have heard of him, was another. After playing an important part in the exciting early decades of particle physics, Gamov turned his attention to teaching people what the things he and his friends had discovered actually meant. These days, with some kind of atomic physics taught to everyone in school, that doesn't seem such a tall order; you can get a pretty good grounding in wave-particle duality or Schrödinger's cat from a quick search of YouTube or Twitter. In the mid-20th century, sharing the secrets of the quantum world was much more of a challenge. Gamow's ingenious answer was to create a bumbling, fictional everyman, Mr Tomkins, who experienced everyday life as though it behaved according to the rules of quantum physics and relativity. Thankfully, Gamow's charming (though slightly dated) books are still in print today. I have a confession to make: as a physicist, I've never taken much notice of the "theory" of evolution. Although I understand it and accept it completely, for some reason, it's never interested me. I've been asked to write more than one book about evolution and always turned them down because I could never engage with the subject. Quite recently, I decided to make amends. I vowed to correct my appalling ignorance by reading one book that would give me a quick, basic grounding in the "theory" and the evidence that supports it. And this was the book I chose. I put "theory" in quotes because, as Richard Dawkins points out at the very start of his book, evolution is not really a theory: whatever creationists might think, it's not some flaky tentative hypothesis still requiring proof. Over the course of the book, he demonstrates that evolution is absolutely in the same class as relativity, electromagnetism, or a dozen other stunningly successful "theories": like any other scientific theory, it can never be proved beyond doubt (because we could always discover something new that disproved it), but it's a scientific explanation supported by such a strong range of such diverse evidence that it's as good as a theory ever gets. Feynman, as I noted a moment ago, is one of the greatest science educators of all time and, though he's certainly one of my heroes, I don't have unqualified enthusiasm for his books. Six Easy Pieces, a short book compiled posthumously from his famous lectures, and the one many people would turn to first, is far from an "easy" read for the kind of audience it's been sold to. There's a great explanation of the conservation of energy, for example, but the elegance of it would be lost on most ordinary readers, who'd find it abstract in the extreme—and far less engaging than a basic explanation involving rollercoasters. Feynman is much better experienced through videos of him chatting, informally, about physics and life. An early 1980s BBC TV Horizon episode called The Pleasure of Finding Things Out is widely acknowledged as one of the finest and most inspiring TV science programs from that era. What Do You Care What Other People Think? contains writeups from that program and similar material from around the same period, shortly before Feynman died. Written in a more engaging and conversational style, this is a far better way to approach Feynman than Six Easy Pieces. Scientists are terrible at communicating their ideas to everyone else—but it doesn't have to be that way. Olson, a marine scientist turned Hollywood-wannabe, explains how he learned this very uncomfortable truth in film school, and how he learned to communicate scientific ideas to ordinary people using techniques they were more likely to relate to. You can read this book as a primer in how to reinvent yourself as a half-decent science communicator. Or you can simply remember the bottom line: most people aren't scientists and don't want to be, but they're (mostly) interested in the things scientists do, they pay for scientific research (through their taxes), and, in the short-term at least, they play a bigger part in the success or failure of science than we give them credit for. If a massive percentage of people don't "believe" in the theory of evolution or the looming dangers of climate change, whose fault is that? And what are you, Dr Scientist, going to do about it? Well, you could start by reading this book!